As part of the planning for this road trip, I trawled through the Michelin website. Within about a thirty-five kilometre radius of Munster there were some fifteen or so Michelin-starred restaurants. Sigh, which one to choose? Do I choose on the basis of geography, how good the food looks on the restaurants’ websites or how nice the people are to me when they answer the phone? Uncertain, I read each and every restaurant description, one by one. Next were the emails to my friend. “Here are numbers one to eight, others to follow. I liked number three best but number eight looked great too. What do you think?” and so it went. 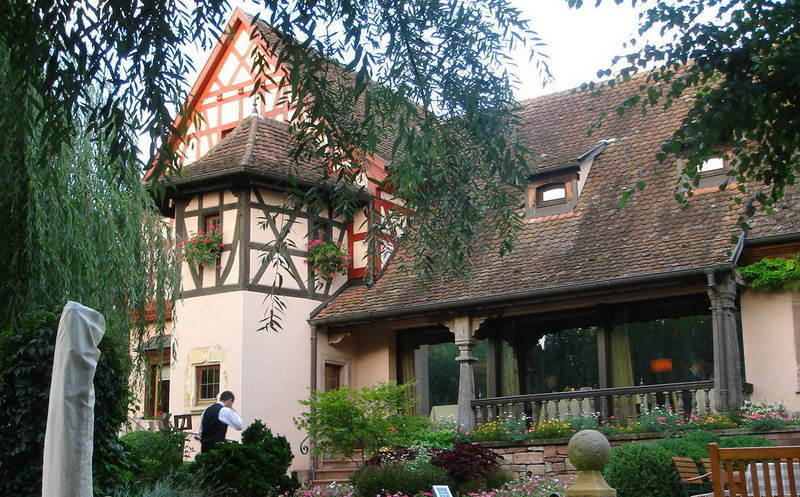 Curiously most were one-star, until I got to number twelve on the list, Auberge de L’ill. Interestingly, this was a three star. What could set it so distinctly apart from all the others? Was this the Sirius Star in a constellation of restaurants? Well that settled that. A decision was made. 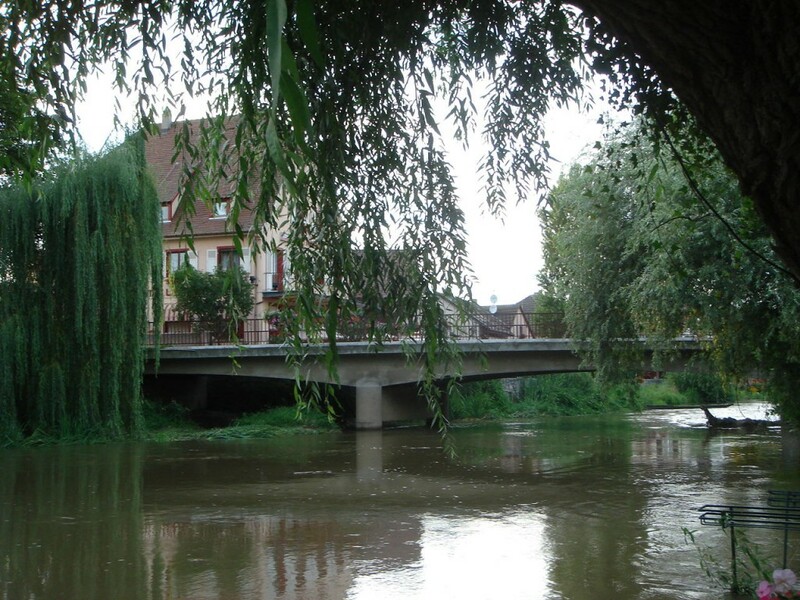 Auberge de L’ill is so named for it lies on the banks of the River L’ill in Alsace, Eastern France. Established in 1878 and famed for the finest of fine Alsatian cuisine (and by some accounts, the best restaurant in Eastern France), it has been an outpost for the creations of many generations of the Haeberlin family. So it was with awe that I stepped onto the path that led us to the key address of this family dynasty. As the door swung open I was simply stunned. The sitting room was decorated as a bold red statement; red furniture, red walls, it was designed to command attention and induce gasps of awe. We are asked if we would like a drink in the gardens of the restaurant. “Oh, yes please”. How could we refuse having already spent some ten minutes taking pictures of the lovely river dotted with weeping willows along its banks? We perched ourselves right on the water’s edge, and sipped champagne (Taittinger of course) with a drop of woodruff syrup, at the suggestion of the waiter. Woodruff is a plant typically used in potpourri; slightly woody, with hints of apple and elderflower, it added a wonderful aroma to the champagne. What an auspicious start to what promised to be an auspicious evening! The dining room was a showpiece of contemporary chic. Set in grey tones, the furniture was elegantly modern; the walls were padded with fabric, thick sumptuous carpet lined the floor. The room was encased by ceiling to floor glass windows permitting views through the willows onto the river. An amuse bouche of bouillabaisse was first up. The soup was rich and delicious; buttery and creamy, it sang out loud of deep lobster flavour. 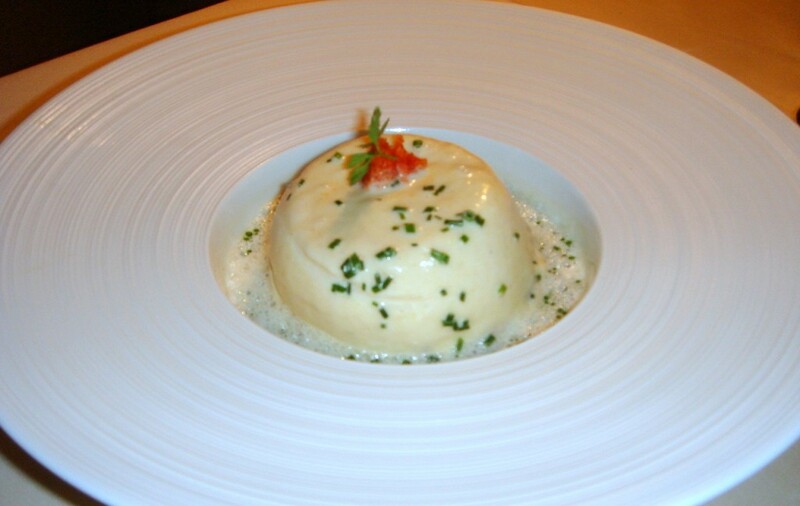 For starters we chose two classics of the house; a mousseline of frog’s legs (€49) and a salmon soufflé (€37). The frog’s legs came blanketed under a layer of gentle, light savoury egg white mousse; slightly denser in texture than that of dessert soufflés, it sumptuously dissolved on the tongue. When paired with the accompanying white wine and chive sauce, it proved to be a masterstroke of French cooking; a perfect balance of butter, cream and white wine against the soft cloudy textural heaven of the mousse and the meatiness of the frog’s legs. The salmon too proved to be similarly blissful. Medium pink and moist, it was smothered under a layer of mousse and white wine sauce. Again the sauce was glorious. Need I say more? 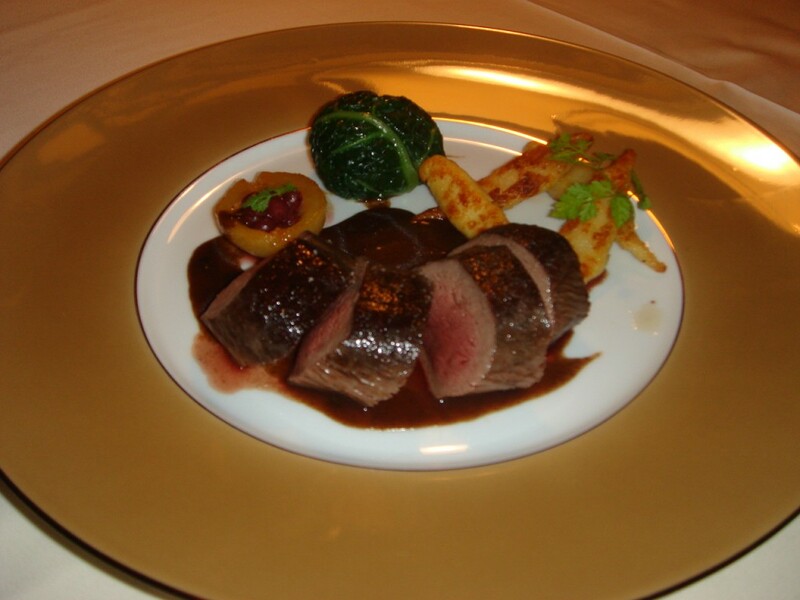 A main of perfectly pink tender venison (€59) was served with a baby pear spiced with Kombawa and cranberries and a local version of gnocchi. The flavour of the kombawa, a limey, lemony fruit, danced a zesty little number on my tongue. And the gnocchi, lightly fried and less starchy then its Italian counterpart, provided a contrasting crunchy counterpoint to the dish. Lamb from Aveyron in the region of the Midi Pyrenees (€55) was titillating in its delicacy; it had the taste of lamb but was devoid of gaminess, so tender it sliced like soft butter to the touch. The sides however disappointed; the artichoke was over salted and the pressed aubergine lacking any real flavour also proved dry. However, all this was irrelevant. On this occasion, the meat was truly the king of kings. For dessert, something that was once grandma’s recipe. A miniature tower of meringue (€55), it was layered high with homemade vanilla ice cream, strawberry sorbet and the creamiest of creams, and finished with a light drizzle of strawberry coulis. 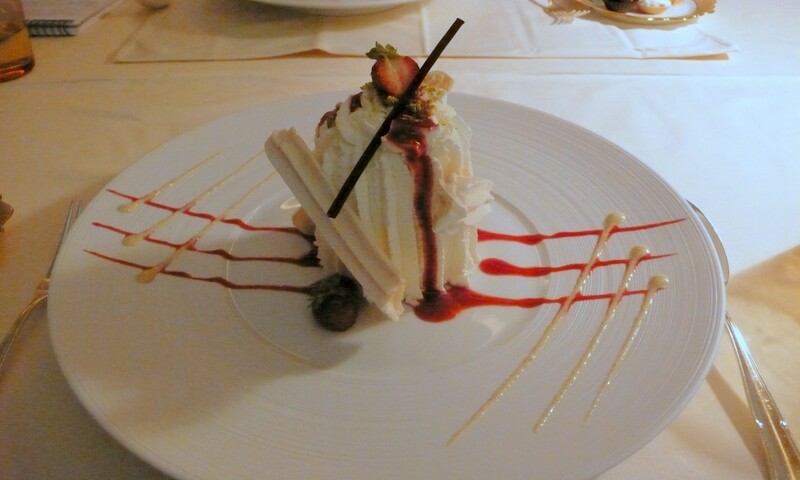 The meringue was light, fluffy and delicately sweet, and when eaten with the ice cream, sorbet and cream it all dissolved wonderfully together on the tongue with little bursts of cold sensation emitting from the icy fruity sorbet. Who knew egg white could possibly taste this good? The service was exemplary without any touch of pretentiousness. No want was left unattended. There were also other nice touches throughout the evening; like when grandpa, an elderly man probably in his late 80s, performed a walk around to greet the guests, and when the chef stood at the entrance to the kitchen to say hello. En route to the bathroom it was fun to gawk at the pictures of previous notable guests; the Queen Mother, Queen Margaret of Denmark and Crown Prince Hirohito of Japan, and en route back it was equally pleasing to have a freshly laid out napkin at my place. However there was a slight irk with the noise levels being surprisingly high, making conversation somewhat difficult. Irrespective, the night had been truly unique. There were stars lining the sky as we stepped out of this homage to food. Yes, a truly starry night it was indeed. I am looking forward to looking through your blog which I found via the Guardian web site. I also have a blog and have been to see Marc Haeberlin. 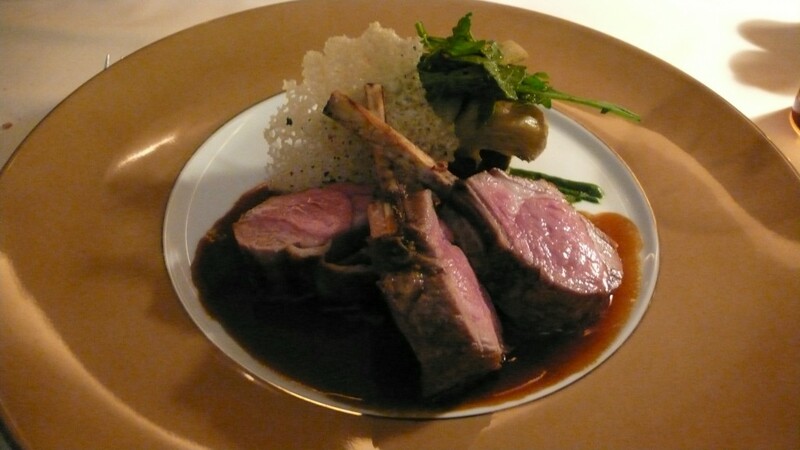 I see you say the lamb you ate comes from Aveyron in the the “Pyrenees” it should read Aveyron in the region of the Midi Pyrenees….the two place are different. Thanks for the tip. I have reflected your correction through my post.